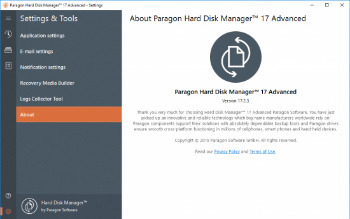 Paragon Hard Disk Manager Advanced includes everything you need for cutting-edge data management and opens up professional system administration options which had never before been possible. Tools such as high-performance file exclusion filters for efficient backup and recovery operations, the sophisticated Paragon partitioning engine, the capability of editing virtual hard disks, Hyper-V guest system backup functions, the powerful scripting option, expanded support for virtual machines and much more make the Hard Disk Manager Advanced the preferred hard disk and system administration software on the market. Data safety is a complex problem that requires you take care of many things. Paragon Hard Disk Manager (HDM) consolidates 25 years of hands-on expertise in system software to keep your data healthy and safe.